MANDALAY — Two villagers in the Letpadaung copper mining region of Sagaing Division’s Salingyi Township were arrested after trying to prevent police from entering their village on Thursday. 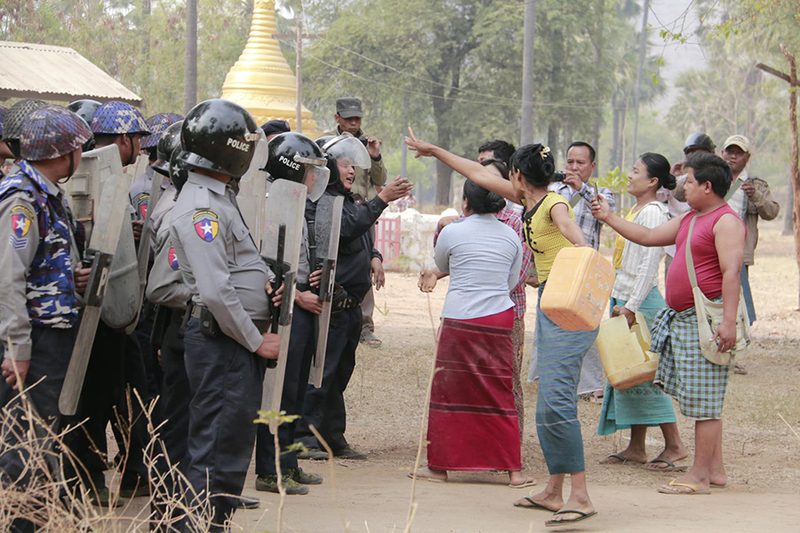 The two women, residents of Wat Hmae village, were among a group of villagers who were angered by the large police presence during a previously agreed relocation of seven households from the village that had been declared to be in a mining zone. According to the villagers, police began setting up security checkpoints outside the village on Wednesday, claiming it was necessary to protect villagers and assist those who wished to relocate to new villages. “We told them [the police] not to enter our village and that we would help the villagers move, but they forcibly entered the village with their trucks, so we confronted them,” said Ko Ko Latt, a resident of Wat Hmae village. The locals said they were angered when about 100 police entered the village via its main road. “The police acted as if they were preparing for battle. We do not want such actions, for we live in peace and have not created any problems as to who will move to a new village,” he said. What began as an exchange of words between villagers and police quickly escalated into a physical clash. Police eventually detained Ma Thwae Thwae Win and Ma San San Hla, who reportedly led the villagers in confronting the authorities. The two women are currently under police detention while receiving medical treatment at Salingyi Township Hospital. According to police, officers from Salingyi Township filed lawsuits against the two arrested women, Ma Phyu Phyu Win—the sister of Ma Thwae Thawe Win—and seven other locals for injuring police and obstructing a police officer, which carries a maximum sentence of 10 years’ imprisonment.